A secret war. An empire in crisis. One final hope for victory. After generations of battles, the Taran Empire is losing the war against the Bakzen, a mysterious race with advanced telekinetic abilities. The only hope for victory is the prophesied Cadicleâ€”foretold to have powers unlike any other. Cris Sietinen and his family hold the key to victory and uniting the civilization. 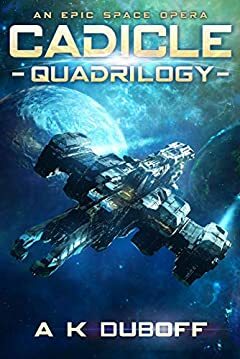 However, as evidence of a galactic conspiracy orchestrated by the governing Priesthood comes to light, Cris realizes that the warâ€”and the real enemyâ€”is not what it seems. This boxset contains the first four volumes in the Cadicle space opera series, perfect for fans of Dune, Battlestar Galactica, and Star Wars.